Going to be in London at the end of September? Drop by the Eurogamer Expo and you just might get some hands-on time with the PlayStation 4. What hasn’t been confirmed yet? Exactly which titles will be playable at the show. 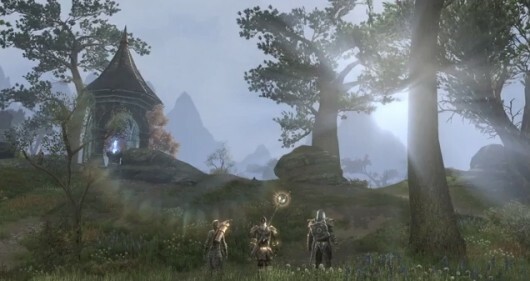 We’ve got our fingers crossed for The Elder Scrolls Online, ZeniMax’s upcoming fantasy MMO. UbiSoft’s The Crew and Turbine’s Infinite Crisis are also confirmed for the PS4 but not for a demo just yet, according to a new press release. The Expo starts Thursday, September 26th, and runs through Sunday, September 29th. Super passes and weekend tickets are already sold out, but Thursday and Friday tickets are still available on the official event website. The difference this time is the ‘cloud server’ infrastructure is actually robust enough to support actual multiplayer in a console system this time, and with the PS4 / XB1 machines on the consumer side, the days of console MMOs are basically here. Hopefully there will be keyboard/mouse support on these systems that makes that option possible. Now that’s a giant spider! Evocative. And looks to be in-engine footage, to boot. Despite all the Negative Nancy blah blah on this one, I still watch that early fly-through of the architecture and think that is someplace I want to adventure in. Which is, for me, what it’s all about.